Heading tags are very important when you build a website. 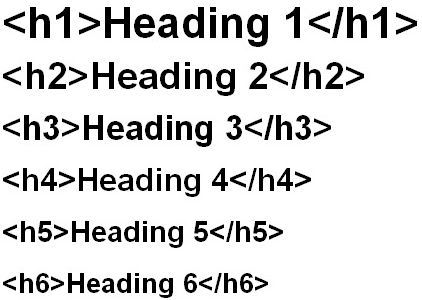 You should use the heading tags to break your page into different sections, using the most important heading tag first then some content and then the next heading tag. Keywords and keyword phrases should also be in your heading tags and always try to have your primary keywords first. Any text that is in the heading tags will be treated as important by search engines and give those words extra strength. Search engines will use those words in the tags as one of the factors when deciding to place the page in search results. The H1 tag is only used once on a page. H2 to H6 can be used as often as you desire, but they should always be used in order, as they were intended. The text size should always be larger than normal text. Include important keywords first in any tag. Heading tags should be compelling encouraging the user to keep on reading. You can change the text size and color of the heading tags using CSS – CSS tutorials. The H1 tag is only used once – it is supposed to be the main heading of the page and shouldn’t be used multiple times. H2 to H6 can be used as often as you desire, but they should always be used in order, as they were intended. For example, an H4 should be a sub-heading of an H3, which should be a sub-heading of an H2. Do not over optimize your heading tags with keywords for the page. Never attempt to hide a heading tag behind a image or use the same color on your text as your background. Never have the same heading tags on different pages of your site. Never have your H1 heading with the same words as your meta tag title.